Gold is a globally admired precious metal, both for its beauty and its utility. This is great news for investors who want a safe store of value or a hedge against macroeconomic disaster. Unfortunately, it also makes gold a very attractive target for counterfeiters and shysters. If you own any gold items, especially jewelry, you should be cognizant of the popularity of gold counterfeit schemes. You don’t want to spend a fortune on great gold necklaces, rings, or watches only to find out that your property is a cheap fake! 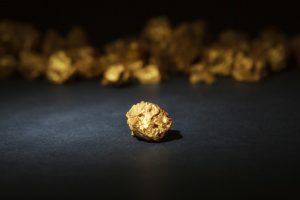 Remember some of the basic elemental and atomic qualities of gold: it is resistant to oxidation; it is non-magnetic; it conducts heat and electricity very effectively; it is soft; it cannot be dissolved by most acids. Knowing these qualities can help protect you against scammers and counterfeits. Here are five test you can try at home to check the authenticity of your gold jewelry (or bullion). The easiest and simplest test—though not necessarily the most reliable—is to obtain a reasonably powerful magnet and hold it close to your gold jewelry. Since gold is not a magnetic metal, your jewelry should remain unaffected. If it sticks to the magnet, it’s fake. (This test also works with silver, another non-magnetic precious metal. )However, there can be exceptions. Many professional counterfeiters know about the magnet test, so they’ll use substitute materials that are not magnetic. Other gold pieces may be relatively low karat (10 to 14 karat) and be constructed with alloys that are magnetic. Additionally, the clasp on some gold jewelry may not be real gold and therefore magnetic. Your gold jewelry should carry a weight commensurate with its gold content. If you have a ring that should weigh a certain amount based on its purported gold amounts, but in reality it weighs materially more or less than it should, you probably have a fake.You can also try sinking gold in a vial of water. This works best with highly pure gold jewelry (22 or 24 karat) that do not contain any gemstones. First off, gold should sink directly to the bottom, neither wavering nor floating. Gold ranks among the most dense metals, which means it won’t lose much weight when submerged. Measure the water levels before and after and weigh the vial before and after. The pressure of the water effectively squeezes the air out of the jewelry, condensing it to just its metallic contents. This requires a more scientific approach, and you should consult online density calculators to aid you. The Bite TestThere is a reason old movie and cartoon characters bite down on gold coins. Gold, especially fine gold, is extremely malleable and easy to dent. Your teeth will leave noticeable marks on your gold item. If your teeth do not leave marks, the jewelry is fake. In terms of cheap ways to test authenticity, the “bite” method is surprisingly accurate. However, the damage to your gold jewelry can be very difficult (if not impossible) to reverse. We do not recommend this test for jewelry or bullion that carries aesthetic value. If you can get your hands on some nitric acid—and you know how to handle acid with the appropriate level of care and respect—then you can perform an acid test on your gold jewelry.Real gold does not react to nitric acid. In fact, no gold alloys at or above 18 karats will react to nitric acid. Almost all other metals do, however: they will turn green. To ensure that your jewelry is not just plated with real gold, it is best to scratch into the jewelry in an inconspicuous place and apply the acid on that mark. Modern manufacturers of authentic gold jewelry take great care to stamp their products with a small seal, or “hallmark.” This should indicate the karat quality of the gold.Unfortunately, the stamp test is not very reliable. Not only can good counterfeiters fake a gold stamp, but older or unique pieces may not carry a stamp despite being real gold. Best to take the seal to a professional who can expertly evaluate the stamp for authenticity. No matter how confident you are in your ability to identify real gold or to administer one of the tests described above, no home test can be as reliable or safe as bringing your gold jewelry to a professional. We recommend seeking out a certified precious metals consultant. Most professionals can carefully administer an acid test without damaging the jewelry. Many modern experts own electronic or thermo-testing, XRF machines. Such machines can accurately and harmlessly tell you the purity of your gold jewelry. Some can even identify all other compounds in your gold alloy. Not even thick gold plating can fool thermo testing devices. American Bullion is committed to responsible and secure ownership of gold and other precious metals. We want all gold users to safely identify the perfect gold products for their need and to help protect them from micro- and-macro economic threats. We are especially focused on protecting hard working men and women from losing their family wealth to the mistakes of greedy politicians or Wall Street banksters. You can own real, physical gold bullion and store it in a tax-advantaged retirement vehicle. American Bullion is here to discuss your options and help you every step of the way. Our number one goal is to help you take control of your own finances—and we promise to be transparent, safe, and efficient in the process.